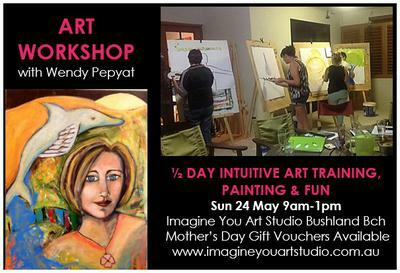 Wendy Pepyat of Imagine You Art Studio is well known in the Townsville area for her workshops and classes held at the Townsville Bikram Yoga centre and her studio in Bushland Beach. Wendy will be holding a special 1/2 day intuitive art workshop on 24 May 2015 9am - 1pm to give anyone with a creative urge a chance to explore their intuitive artistic side and learn to paint from within. As Wendy explains, "My aim is to share some amazing, fun techniques on how to use your intuition to get creative. If you already paint and want to free up your painting style, I can help you with that. Everyone has intuition; activating this will do amazing things for your creativity. You will learn some great visualisation techniques and who knows what you will see in there. You will learn how to paint from within. It's all about YOU and having fun splashing some paint around in the process, there are no wrong paintings. 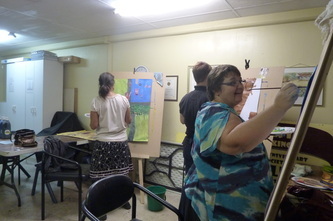 Being creative is an invigorating and amazing stress relief, you will be very surprised. If you consider yourself creatively challenged, fear not! All you need is curiosity and an open mind." All materials and morning tea are included, and will be a great opportunity to meet other creatively-minded people in the Townsville area. 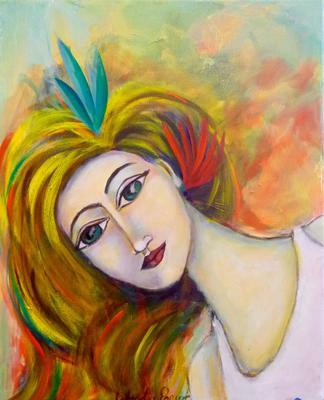 I had my own experience connecting with her work when, only 2 days after we met, she posted her latest finished work - a portrait of a girl with 2 coloured feathers in her hair. What struck me immediately was the angle of the portrait - the same angle of a photo of me in my LinkedIn profile picture. Then a second thing struck me - the feathers in the girl’s hair were in my logo colours, and they were FEATHERS! You see, my business website is 2 Birds 1 Stone - a specialist artist support service agency (www.2birds1stone.com.au). And looking even deeper into the painting, I realised the background colours were very similar to a pastel work I had dabbled with years ago. I am convinced Wendy had been painting a picture of me, without ever having met me, or known we were about to meet just as she was finishing it! 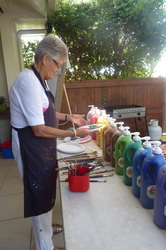 I immediately suggested she hold a workshop inviting those around North Queensland to come and learn how to paint intuitively for themselves, and meet a few artistically spirited people along the way! I hope you can join Wendy and me on the 24th of May. If you cannot make the workshop on the 24th May, Wendy offers one on one tuition. So get your intuitive urges flowing and give Wendy a call to book on 0439 936 390. Please contact Wendy at www.imagineyouartstudio.com.au to book.